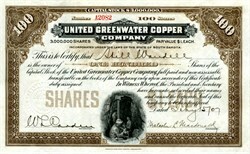 Beautiful uncancelled stock certificate from the United Greenwater Copper Company issued in 1907. This historic document was printed by the American Banknote Company and has an ornate border around it with a vignette of miners working underground. This item has the signatures of the Company's President, Malcolm L. MacDonald and Secretary. The United Greenwater Copper Co. was recently organized by Malcolm L. MacDonald, president of the Nevada Smelting & Mines Corporation, for the purpose of operating 15 claims on the eastern extension of the ledges of the Greenwater & Death Valley. The company is organized for 3,000,000 shares, of which 1,000,000 shares are treasury stock, and it is understood that the Nevada Smelting & Mines Corporation will permanently hold a majority of the stock issue. The property has two shafts, each of which is being sunk in ore, the showing being about the same as those on the Greenwater & Death Valley property. GREENWATER A DEATH VALLEY. This latter proposition is capitalized at 3,000,000 shares, par $1 each; 1,000,000 shares being set aside as treasury stock. The property consists of 20 claims in. the Greenwater camp, seventy miles south of Bullfrog, Nev. The feature of this property so far is its enormous surface showings and high copper assays, the main ledge traversing the property in a bold outcrop nearly one mile in length and measuring from 20 to 200 feet in width in places. Lack of water has been a great drawback to the development of this camp, this necessity of life having previously been hauled 28 miles by wagon. This drawback, however, is being overcome by the sinking of wells, which are counted upon to furnish a supply for living and commercial requirements in the future. The present nearest railroad point is Johnnie Siding, on the Las Vegas & Tonopah Railroad, 40 miles away, this being the present shipping point for all supplies and machinery. The Tonopah & Tidewater Railroad line will pass within 12 miles of the Greenwater camp. Greenwater Valley was the site of the most spectacular boom in the history of Death Valley mining. While other districts, such as Bullfrog, Lee-Echo, Panamint, Skidoo and Leadfield had their booms, which saw rushes into new mining areas and the establishment of new mining camps and towns, Greenwater surpassed all the others in the brilliance of its birth. Within a year and a half from the beginning of the rush to Greenwater, the deserted desert was home to over two thousand inhabitants in four towns, seventy-three incorporated mining companies, and was the focal point of over 140 million dollars worth of capitalization. But it was not only the amazing rush to Greenwater which sets it apart from other booms, for Greenwater also experienced the shortest life ever recorded for a boom camp of its size. Within one year from the height of the boom, all but five of the companies had left the district, and Greenwater was practically deserted. By the end of two more years, everyone had given up, and the Greenwater Valley, the scene of so much bustle and excitement a short time before, was once again completely deserted. This combination of a tremendous boom, a brief life and then complete desertion, all within the space of less than four years, has made Greenwater a name which is still anathema to the investing public, and dear to the hearts of desert folklorists. Few, if any, mining camps in the American west have ever combined such initial excitement with such total disappointment. Inevitably, considering the popular place of Greenwater in the annals of western folklore, it is sometimes difficult to separate the fact from the fiction surrounding the history of the district--and there is no lack of either. Although the argument about who really discovered Greenwater started as early as 1906 and has continued ever since, it seems apparent that the honor must be divided. Some prospectors later claimed that they had made copper locations in Greenwater Valley as early as the late 1890s, but the obvious difficulties inherent in mining copper in an isolated spot caused such locations, if made, to be abandoned. The real discovery of Greenwater, as with most throughout the Death Valley area, came about as a result of the Bullfrog boom, sixty-five miles to the north. As noted before, the great rush to the Bullfrog Hills soon filled up the ground in that vicinity with location notices, and late-arriving prospectors were forced to move farther afield. Two such men, Fred Birney and Phil Creasor, ambled south down the east side of the Black Mountain Range, and in February of 1905, while looking for gold, uncovered rich surface croppings of an immense copper belt in Greenwater Valley. Birney and Creasor sent samples of their find to Patsy Clark of Spokane, a well-known copper mining operator, and Clark was sufficiently impressed to buy the claims from the two men in May. Hard on the heels of the townsite consolidation came the news of another large merger, which set even the feverish minds of Greenwater agog. Several of the leading mine owners, realizing that the district needed a smelter in order to become a producer, announced the formation of a giant merger towards that purpose. On December 15th, Charles Schwab, John Brock, and some financiers from Philadelphia formed the Greenwater Death Valley Copper Mines & Smelting Company. The merger company had a capital stock of 5,000,000 shares, par value $5 each, for a total capitalization of $25,000,000--an amazing sum which astounded even such boom-hardened towns as Goldfield and Tonopah. The new corporation was essentially a holding company, and consisted of the majority interests in the Greenwater Death Valley Copper company, the United Greenwater Copper company, and the unincorporated mines belonging to Brock and the Philadelphians. By pooling their resources, Schwab and his partners hoped to be able to cut costs and erect a large smelting plant for the reduction of the ores from each of the mines. Although no specific site was announced, Ash Meadows immediately became the leading contender for the smelter site, due to its proximity to a plentiful water supply and the railroads. In 1907, the Nevada Smelting & Mines Corporation' which owned the control of the United Greenwater Copper Company, has exchanged its stock for the stock of the new Greenwater Copper Mines & Smelter Co.